Custom Designed for each specific application. 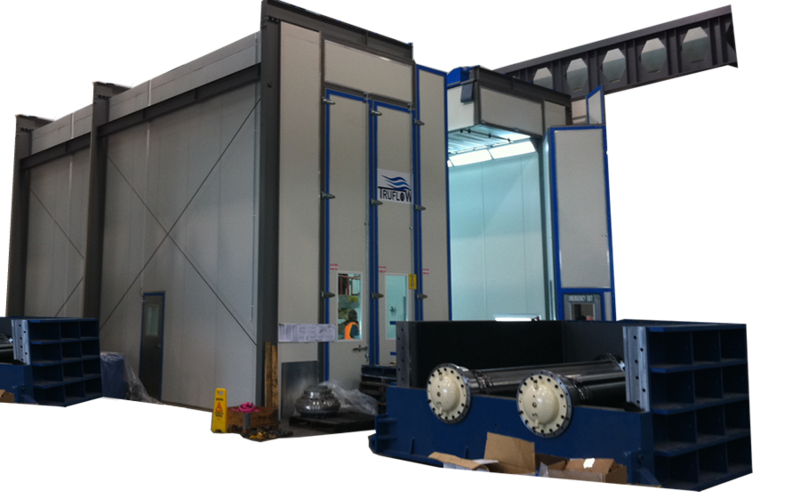 Truflow’s can custom engineer a spray booth with a crane entry requirement or modify a standard product from our DB Series Industrial Spray Booth Range. Each unit can be made to suit your working environment and products. This range has proven to be a beneficial design feature for customers in the mining and industrial equipment industries as well as steel fabrication. Each system is fully compliant to Australian Standards and modular in design. When looking at a solution specific to your spray painting process our team will look at how you prepare, move, paint, store and stock/dispatch your product. This will allow us to understand the workshop flow and also how much space you are able to give the spray painting process. We will then discuss a number of solutions and prices to best understand your scope. Once a preliminary solution is tabled we can then design and fully cost this project – giving you a clear understanding of scope and design with 3D drawings included. You can contact a TRUFLOW engineer today to discuss. 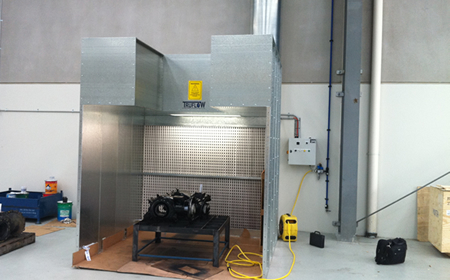 Enclosed: Enclosed Spray booth with pneumatically operated sliding roof – Can be heated. 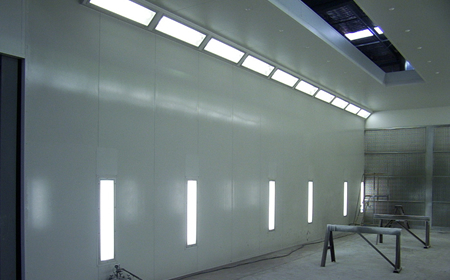 Internal Rail: Enclosed Spray booth with internally mounted rail that travels through the entire spraybooth cabin. Spray Area: Applicable only to large scale facilities for blast and spray, large scale / structural and marine. Which industries does this apply to? Basically any industry where you must move your product into spray via an overhead crane. Typically Mining Equipment, Oversized and irregular structures, Contract Painting for large-scale equipment in regional areas, blast and spray contract works, large scale structural steel,Boating & Marine as well as Aviation and Aerospace. 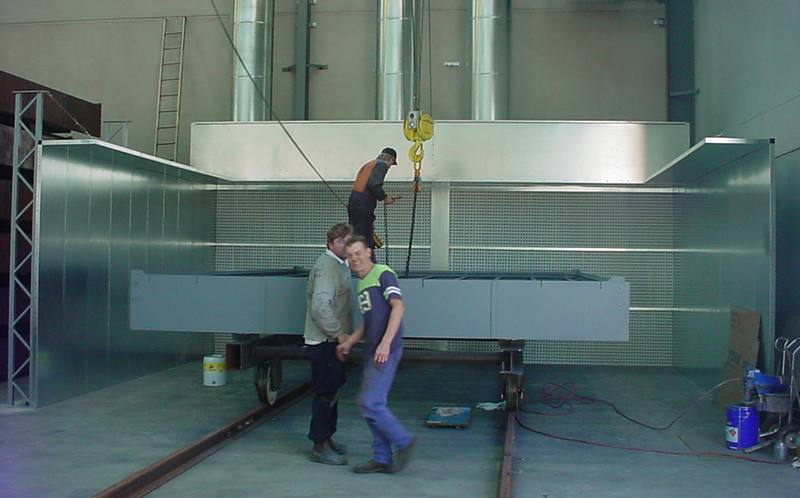 From our dry filter range a modular booth can be designed with crane openings. Engineered solutions that are fully enclosed with sliding roof systems to allow crane access while providing a clean heated spraybooth. 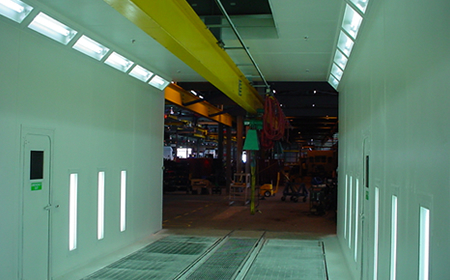 Overhead internal crane rails can be fitted internally in either motorised or manual setups. This conveyor or overhead rail can work with or independtly to a factory crane. Spray areas in various formats provide a flexible and compliant space. Entry can be directly into the booth with work areas fitted as required made from curtains or panels.